One of the most in-demand new career paths involves big data analytics. The term refers to the practice of interpreting large amounts of business data to reach important conclusions and gain actionable intelligence. Interpreting data can help business professionals develop strategies for growth, improvement and change. The practice of data analytics is relatively new given that it has developed in accordance with the growth of the digital age. Data analytics relies on sophisticated computer-based platforms, which is why the industry is continuing to grow. As U.S. News & World Report detailed, a vast majority of data that is being scrutinized today did not even exist prior to 2011, a statistic which clearly points to the youth of this sector. The source elaborated that the demand for professionals in the data analytics field will continue to grow exponentially in the coming years, and that a significant shortage of qualified workers—predictions indicate a deficit of 190,000—will become apparent within the next two years. Professionals with analytical capabilities are in demand across a range of industries, including healthcare, insurance, manufacturing, finance and information technology. Positions in the IT field are in particular demand. According to Forbes, common jobs for data analytics professionals include big data platform engineer, information systems developer and software engineer. A career in big data analytics is also typically very lucrative. Forbes noted that the average salary for big data professionals is in excess of $120,000. If you are considering embarking on a career in big data analytics and are looking to increase your job opportunities, consider enrolling in Villanova University’s Online Master of Science in Analytics program. The course of study will educate you in a number of areas pertaining to the use of analytics in a business setting and will bestow you with skills that are key to success in this area. For a career in big data, California offers some of the best opportunities. As outlined by Forbes, the cities and surrounding suburbs of San Jose and San Francisco boast not only high volumes of jobs in this area—close to 3,000 in San Jose—but also incredibly lucrative wages. Professionals typically earn six-figure salaries, starting at $119,000 per year on average; higher paid workers can command close to $200,000 annually. The high salaries are a necessity though. Due primarily to the burgeoning technology industry, the cost of living in California is incredibly high, particularly in the San Francisco Bay Area. CNN Money reported that San Francisco has the highest levels of rent of any other city in the country, including New York City. Average rent for a modest two-bedroom apartment in San Francisco stands at just over $4,600 a month, with homebuying prices also relatively high—the average cost of a family home in the city is just over $1 million. For cheaper rent and cost of living, nearby Oakland offers more affordable options, although with increasing gentrification, prices are continuing to rise there too. Forbes explained that the New York City metropolitan area, which includes Long Island and parts of northern New Jersey and southern Connecticut, is an ideal location for job hunters seeking opportunities in the field of big data analytics. The source reported that prospective candidates can expect salaries in the six-figure range, with top earners commanding over $170,000 per year. The job volume is also high, with 2,333 open positions in the field being posted in the late fall of 2015. As with the Bay Area, however, you will likely find yourself paying more than the average American when it comes to living expenses. Popular finance website Smart Asset reported that the cost of living in the New York City area is almost 70 percent higher than the national average. Across the whole metropolitan area, the average cost of renting an apartment with two bedrooms is in excess of $1,600 per month, although that figure increases tremendously the closer you go to Manhattan. Average rent in Manhattan is close to $4,000 a month. With all the trappings of a global city, you could find that the rush and excitement of a new life in the Big Apple are too enticing to ignore, despite the higher costs. Looking to strike a balance? For a more reasonable cost of living, consider relocating to suburban Long Island and commuting to work, or perhaps to a city on the New Jersey side of the Hudson River, such as Newark or Jersey City. The nation’s capital offers plenty of job opportunities for professionals with skills in analytics. With a plethora of opportunities—Forbes reported a job volume in excess of 2,000—and competitive salaries starting in the six-figure range, the capital area could be the perfect place in which to kick-start your new career. In addition to the amazing career opportunities on offer, the city itself is very livable. Home to famous landmarks, countless stores and world-class restaurants, Washington DC is a bustling cosmopolitan area. If you relocate for a job in DC, you will likely be tempted to move into the city proper, but consider moving to a nearby town in neighboring Maryland or Virginia instead, as renting prices in the city are predictably expensive. Smart Asset noted that a two bedroom apartment within DC city limits costs $2,776 to rent per month. Home of Microsoft, the state of Washington and the city of Seattle in particular boast plenty of big data job opportunities. Forbes noted that around 1,500 open big data jobs were found at the tail end of 2015, and that figure has no doubt increased this year. Salaries are also generous, although a little less competitive than in neighbor to the south San Francisco. Professionals in the field of big data can command anywhere between $96,000 and $140,000 per annum. As with other cities on this list, the Seattle area is fairly expensive in terms of cost of living, although not unreasonable. Career website Payscale reported that the cost of living in the Emerald City is over 20 percent higher than the national average—considerably cheaper than New York City or San Francisco but expensive nonetheless. The high salaries that you earn as a data analytics professional, though, will likely offset this cost. And with myriad bars, restaurants, stores and a vibrant outdoors culture, Seattle could be the perfect place to kick-start your career in big data analytics. Home to world-class institutions of higher education, the Boston metropolitan area is home to an expanding technology industry. 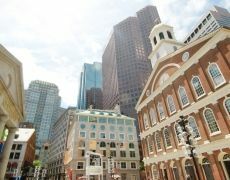 Given that careers in analytics can be found in the IT sector, it should come as no surprise that Massachusetts is a great place to begin your big data career. Forbes detailed that average salaries start at just under $100,000 per year, while some of the highest earners can command close to $160,000 annually. In terms of open positions, the source reported a job volume of just over 1,200. A vibrant and walkable city, replete with storied architecture and unmissable sites, Boston is an exciting place to begin a career. The cost of living, however, is a little less appealing. Average rent for a studio apartment, for example, stands at close to $1,900 a month, Smart Asset stated. For more affordable living consider moving to suburban areas such as nearby Waltham or Quincy. The Metro West area of Massachusetts, including the city of Worcester, offers a much more affordable cost of living, and with commuting times to Boston just over an hour, you could strike a balance between affordable living and big city working. Your key to a six-figure big data career may be a Master of Science in Analytics degree. If you are looking to complete your studies alongside your current career and personal commitments, consider the ease and flexibility of the online MSA program at Villanova University. For more information, review the admissions page.